These Mason Jar Salads are an easy make-ahead meal, topped with hearty roasted sweet potatoes and protein-rich quinoa. They make a convenient packed lunch for the week, or a fast weeknight dinner! I don’t know about you, but I find it challenging to eat cold salads when the weather cools down. Sometimes I’ll reach for warmer comfort foods, like this Sweet Potato Noodle Casserole or Instant Pot Vegetarian Bolognese, but I don’t want to avoid leafy green salads all winter long. That’s why I’ve been trying to find some more comforting salad options. If you ask me, great salads are really all about the toppings, so here are some cold-weather salad toppings to help make your next salad a little more hearty and satisfying. This make-ahead salad recipe features several warming salad toppers, including oven roasted sweet potatoes, quinoa, and a spicy orange-ginger dressing. The combination is totally addictive, and you can prepare all the cooked toppings ahead of time for a convenient option all week long. This hearty vegan salad makes an easy packed lunch or fast weeknight dinner. Loaded with fiber and plant-based protein, and a spicy ginger dressing. Preheat the oven to 400ºF and arrange the potatoes into a single layer on the pan. Drizzle the potatoes with olive oil and use your hands to toss them in the oil. Sprinkle with salt and roast until tender, about 20 minutes. Once the potatoes are in the oven, combine the quinoa and water in a small saucepan over high heat and bring it to a boil. Cover and lower the heat and allow the quinoa to cook until tender, about 15 minutes. While the potatoes and quinoa are cooking, prepare the salad dressing. Combine the orange juice, vinegar, olive oil, honey, ginger, and mustard in a high speed blender and blend until smooth. Set aside. 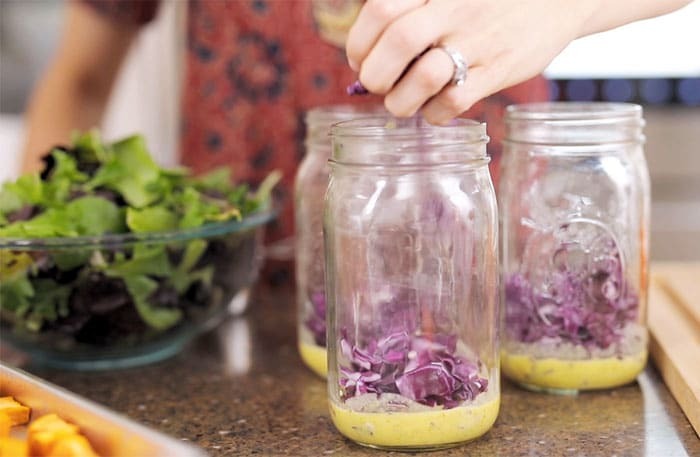 To assemble the salads, add a 1/4 cup of dressing to the bottom of a mason jar. Then add the shredded cabbage, cooked quinoa, carrots, sweet potatoes, and leafy greens on top. Seal with a lid and store the salads in the fridge until ready to serve, up to 5 days. When ready to serve, shake the jar to help distribute the dressing, then dump the jar into a large bowl and serve immediately. If you love the taste of ginger as much as I do, use the full 2 tablespoons. It makes the salad a lot more warm and spicy! However, if you’re hesitant about ginger, start with just half that amount, or even less depending on your taste buds. As written, this recipe is properly combined. However, feel free to add any other extra toppings you like, such as dried fruit, nuts, or seeds. As always, if you make a modification to this recipe, please leave a comment below letting us know what worked for you. We can all benefit from your experience! Reader Feedback: What’s your favorite salad combination when it’s cold outside? I also love this Holiday Salad, which I make at Thanksgiving and Christmas, and this Brussels Sprouts Salad! I love the this combination and the dressing. It’s so nice to be able to do this ahead and have a healthy lunch at work. They are filling! Thank you! 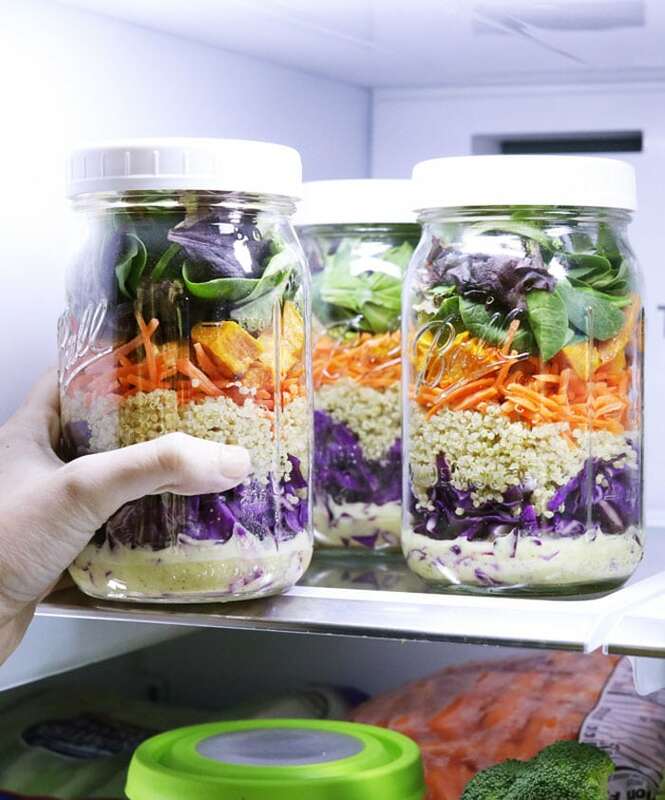 YOUR IDEA TO PRE~MAKE THE SALAD & DIVIDE INTO JARS IIIS BRILLIANT! Due to illness, I rarely have the energy to Even Assemble A Salad, so This Idea Totally Makes It Possible For ME! 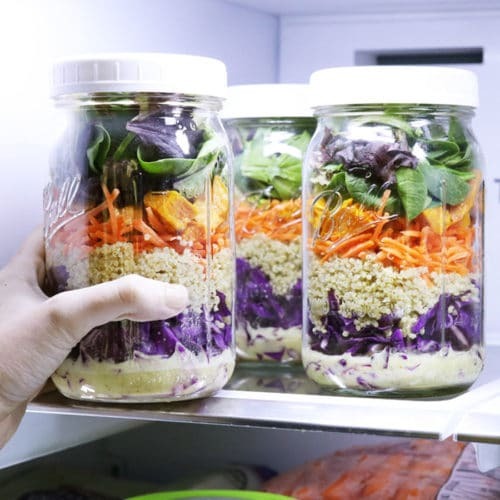 Jar question- It appears from the photo here that you are using quart jars for your salads, but the link to the jars is for pint size. Could you please clarify? Thanks for the great ideas! Yes, they are quart sized jars. That’s an option in the Amazon link– they just won’t let me specify the size that automatically comes up. I ordered the 12-pack from there. I absolutely love this salad combo! I usually have a hard time making myself eat salads for lunch because I get so bored, but I love this one. I didn’t have any orange juice or mustard when making the dressing (I was just making myself a little mini to-go cup, so a very small amount of dressing) so I used lime juice instead. Still turned out great! Thanks for the ideas! I am going to make those mason jar salads for my next out of town work trip! Also I’m making the quinoa stuffed acorn squash and the vegan gravy for my thanksgiving today so thanks for those recipes as well. Love a good make ahead salad! I think I’ll try with cauliflower rice instead of quinoa!